I’ve been in love with bike commuting for years now. At one point, my commute was 19-miles per day. I’ll admit, that was a little ridiculous. It was a great workout but it took too much time out of my day. However, I’d definitely encourage anyone to commute via bike up to 15 miles. 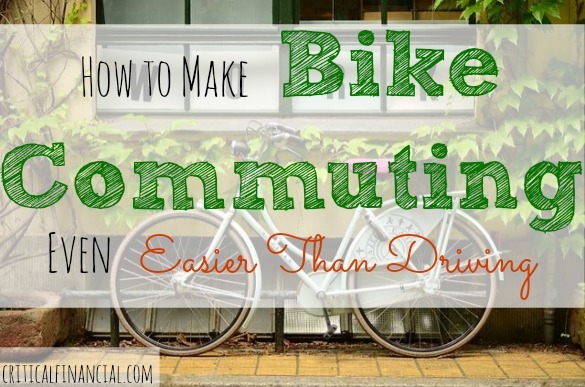 When I first started commuting by bike, I just jumped on my bike one day and took off down the street. I didn’t buy any special gear – not even a helmet. I learned as I went. To save you the trial-and-error, I’m recording my findings within this post. A lot of people buy a ton of ‘biking gear’ before ever turning a pedal. This is a mistake for a few reasons. First off, it’s easy to buy stuff but it’s hard to actually use it. You may never start biking. Try to delay those costs, if possible. Wait until you find you actually need those $40 specialty biking gloves. I started out using a mountain bike on pavement. How silly was that? It’s so weird that stores stock so many mountain bikes. I live in Nebraska. We have no mountains. Using a mountain bike on pavement is hard. It will give you a good workout. If that’s what you’re after, get a mountain bike. 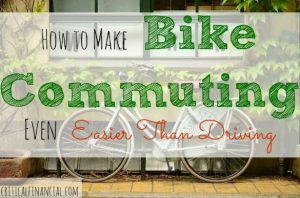 But if you’re trying to commute with minimal sweating, consider either a hybrid, commuter, or road bike. They all offer thinner tires. Thinner tires create less resistance. Less resistance means easier pedaling. During the winter, using a backpack works well. But during the summer, that will make your back sweat. I used to throw the pack over the handlebars. But that’s dangerous. The straps could get caught in the spokes. It also degrades the engineering of the bicycle. It becomes front-heavy which reduces balance. Although getting bags for the bike aren’t necessary, it really makes the experience better. I read a horror story about someone who bought a Walmart bike. He hit a bump after going through an intersection… the frame welds broke and he went flying. I’ve ridden Walmart bikes. Heck, during my 19-mile commuting days, I had a Walmart bike. The problem with those bikes is they begin to wear out pretty quickly. Parts are sometimes hard to get. Bike shops don’t enjoy working on them. Sometimes it costs more over the long-run to own one of these cheap bikes. However, if you don’t have enough money right now, you can get a Walmart bike – just make it a Schwinn. Schwinn has lifetime warranties on parts. Labor may still get expensive though. But overall, Schwinn is still a pretty good bike. Unless you live within a mile from work, you’ll probably want to change there. If your office doesn’t have a locker-room – a large bathroom stall will work just fine. Arrive 10 minutes early to work. The handicap stall will almost always be open. You can change in a regular stall in a pinch. It’s not as hard as it may seem. A lot of people have very negative things to say when you announce you commute via bike. I’m not sure where their negative words come from. But it’s okay. There are tons of people who give positive reinforcement. Those are the people you want to listen to anyway. When you’re riding at a normal pace, the wind keeps you from sweating. But when you stop – the sweat pours. Therefore, if you slow down for the last 10% of the trip, you won’t sweat when you stop. It’s like a cool down period. This is important especially if you’re heading to work. No one wants to sweat before coming into the office. Check your city laws regarding biking. My city has all sorts of rules to obey. They have rules about where you can ride on the sidewalk, what lights you need on the bike, whether or not to wear a helmet, etc. etc. Every city I’ve known of requires both a tail light and head light. They must come on at dusk. This increases your safety dramatically at night. When I first started riding, I was too cheap to get lights. I figured the street lights were good enough. But they aren’t. If you get in a shadow, you’re blind. Use a Lock – All the Time! It takes 10-seconds to lock the bike. You don’t want anyone stealing it. If that happens, it’ll be quite the nightmare. After all, a bike is a form of transportation. No one likes to have their transportation habits affected. I LOVE biking. In fact, I’ll go a month at times without driving my car. It’s an awesome lifestyle. And yes, it does seem hard at first. But once you get over the mental block – you’re home free. Biking makes a person healthier, wealthier, and happier. Good luck. Leave a comment if you want more specific advice. I’d love to help you out.